Shopping in Hong Kong is an experience unlike any other. Shopping like a local in Hong Kong is even more interesting – especially when you’re obviously not a local. Follow along and see what I learned about bartering like an expert. Saturday afternoon, my friend Jen and I went with a local girl named Kathy to Mong Kok and Sham Shui Po to get supplies for the “West Meets East” cultural event we were hosting the following Tuesday night. You see, Jen and I joined the student group called the Exchange Activities Committee at the beginning of the semester and it was composed of three exchange students and four local students. Throughout the semester we hosted a series of fun events encouraging local and exchange student interaction. So our first big event was a demonstration of Eastern culture: tai chi, calligraphy, Chinese knot making, Chinese dance, kung fu, music, and traditionally Eastern snacks (free food is a big draw no matter where you are). 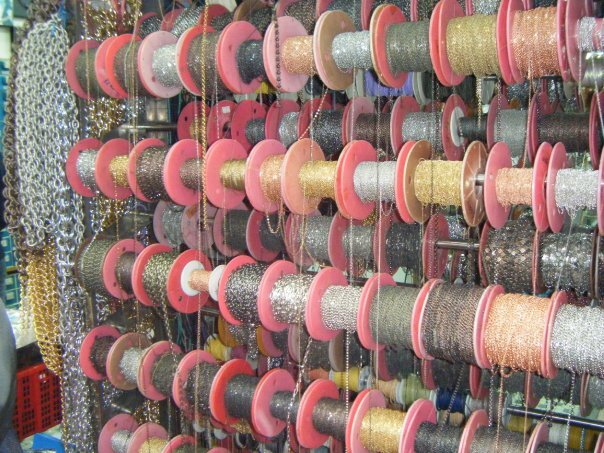 We went first to Sham Shui Po, which was an amateur jewelry maker’s dream; there were bead, ribbon and chain shops all packed into a few streets that crisscrossed each other. 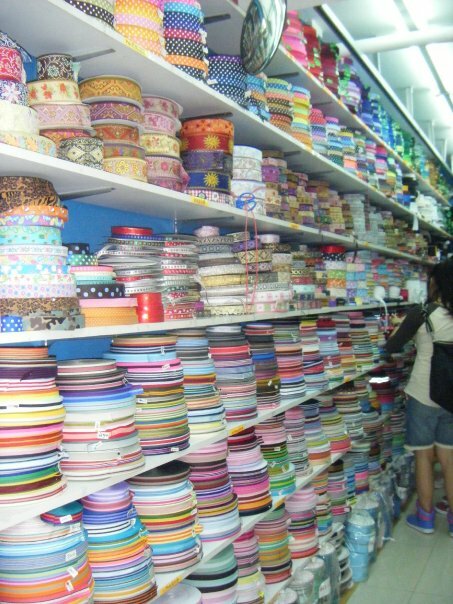 Here’s betting you can match any outfit known to man with one of these ribbons. Not exactly the chains and whips you were expecting? You’ve honestly never seen so many shops selling beads, jewels and every type of string so closely packed together… and so many people eagerly picking them out for who knows what kinds of arts and crafts projects! After finally finding what we needed there, we headed over to Mong Kok to pick up a tai chi outfit for the demonstrator to wear. Kathy told us to give her some distance in the Ladies’ Market (ie Mong Kok), because if it looked like we Western girls were with her (a native), the sellers would automatically raise the price (ah, the joys of being a white person in Hong Kong). 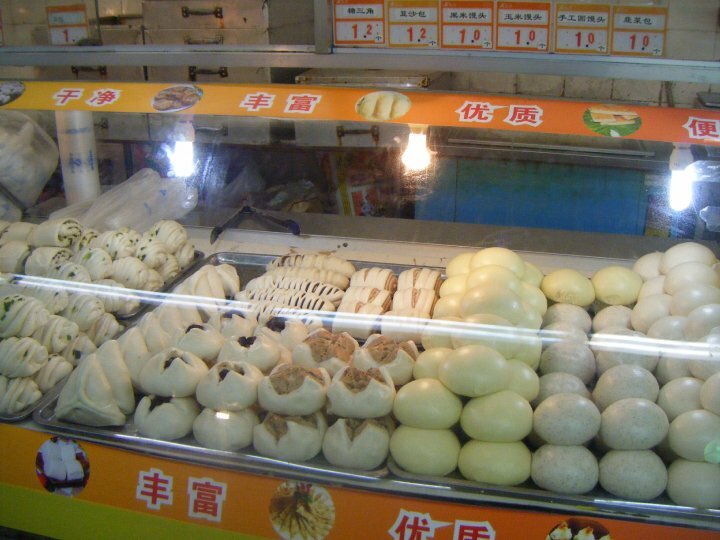 Our second task completed, we moved on to Hung Hau to find cheap calligraphy brushes for the Chinese calligraphy workshop, and when this mission was accomplished, we did the fun “task” of taste testing different Chinese baked goods to decide what kinds of snacks to offer Tuesday night. After much tasting (courtesy of the school’s budget) and debating we settled on four different, traditional pastry snacks. Finally, we met a couple more friends who stayed on campus to study during the afternoon for dinner in one of the Hung Hau malls (there are multiple malls at almost every MTR stop without fail), and with Kathy’s help (and excellent Cantonese) ordered a very tasty dinner before heading home. 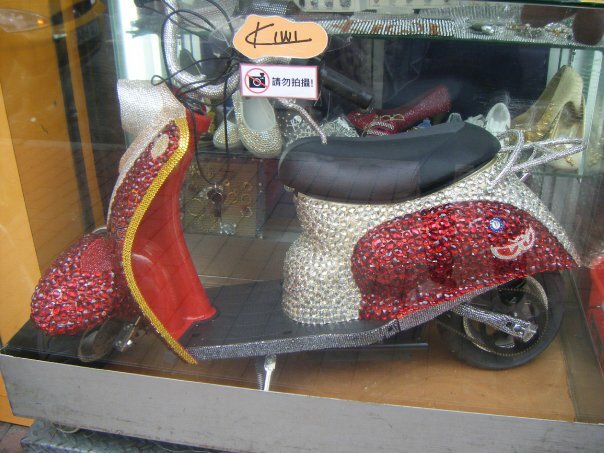 Completely and totally bedazzled scooter. Obviously someone needs a new hobby. Sunday and Monday, weren’t nearly so adventure filled. The weather got cold – AGAIN!!! Plus, I had quizzes and exams coming up the next week and I’d started preparing for them, in addition to the odd homework assignments that had to be turned in (it was so different for homework to actually count as part of the grade for some of my classes; I felt like I was back in high school again). So I lived in the library and coffee shop (unfortunately not a Starbucks – I wish) for a good part of each day studying, working with groups on homework, and generally trying to stay warm. Not very riveting, I concur. But another reason for the study push was that I was trying to get a little ahead, because Thursday would be my 21st birthday and I had big plans! The only slight disappointment was that unlike if I were turning 21 in the States since everyone can drink in China once they turn 18 it wasn’t considered a big deal there. But it was still a big deal in my mind. So I’d planned to do dinner out with a group of people at this Korean barbecue restaurant where you paid a flat fee, cooked your meal on hot grills in the middle of the tables, and ate as much as you could handle. After this, I planned to go out to the most famous of the bar districts in Hong Kong, Lan Kwai Fung (LKF for short) and dance the night away (good plan on a full stomach, right?). And conveniently, Thursday night was always Ladies’ Night in LKF, so all the girls would get into the clubs and bars for free! How much better could it get? I was so excited for Thursday; my fingers were crossed for warmer weather by then. Don’t miss next week’s tales of birthday outrageousness! It really turned out to be a memorable 21st! 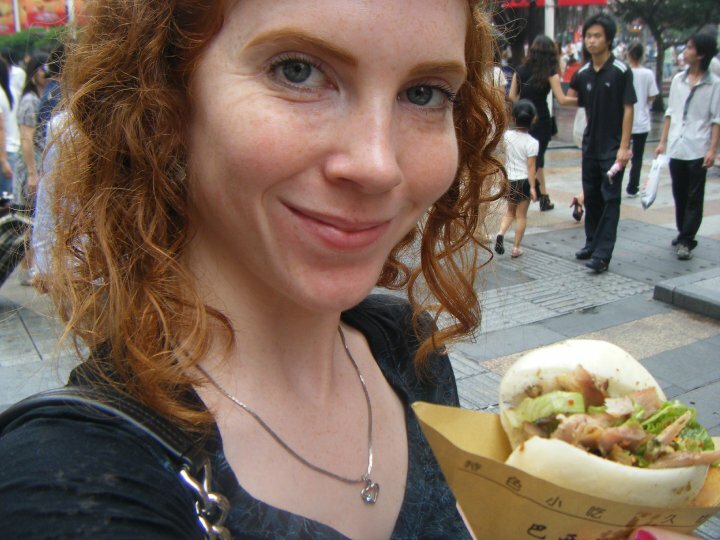 Street food rarely failed to bring a smile to my face. This trend really needs to catch on more in the US. This entry was posted in Asia, Hong Kong and tagged Asia, Beads, Hong Kong, Scooter, Shopping, Travels on March 12, 2014 by Paige N..